The secret of Click-N-Manage ®: a clear separation of roles and responsibilities combined with outsized experience in re-engineering and optimization of business organizations. One of the missions of Click-N-Manage ® is to manage the dynamic links between employees and the quality system. Who? DO What? Where? When? How? A member can play one or many roles. A role may be involved in several processes and be exposed to one or more risks. The activity of your business is described in detail (procedures / processes), including the system of internal control (risk). Documents (form, checklist, template, instruction, guide, user manual, program, …) are available in 3 clicks. For example, an employee-actor his job description and degree of participation in the quality system in terms of actions and responsibilities. for the administrator’s workstation only: Java 6. Facilitate, accelerate, ensure a good update of management systems (roles, tasks, controls, documents). Emphasize the links between several organisational entities. It allows the Quality Manager, Head of Management System or the Department to formalize a management system. Click-N-Doc® keeps updating its complex management system with ease. Management of dynamic links between records. It was designed to streamline its management system, processes operational documents WHO do WHAT WHERE HOW with WHICH RESOURCES. Automatic management of the procedures background and versions. Each change done within the management system is automatically and instantly repeated wherever it was originally referenced. Facilitate the integration of different management systems together (internal control, quality, environment, health & safety, risks management…). Maintain updated in real-time the collaborators specifications with their roles and responsibilities such as described within the quality, health & safety, environment (…) management system. Reach quickly and intuitively the elements of the management system that need an update. Risk of error while updating a reference that is not managed with a database system. Uneasy updating of the organization system. Manual follow-up of all the modifications of the organization system. Each modification of the system structure brings about a manual checking of the system coherence. Take the risk to lose the links between roles and responsibilities described within the EHSQMS and those described within the collaborators specifications. Slow and non-intuitive research of the relevant data within the EHSQMS. Enable everyone to visualize its positioning, roles and responsibilities within the added-value chain. Simple and intuitive graphic display of the tasks to realize. Communicate effectively in intranet / internet. Search, order and sort the information. Click-N-Share® can be accessed from the corporate network and why not from a USB key! It requires no configuration. Click-N-Share® lists the wrong links to documents. Easy and intuitive navigation to all levels of the organization. Automatic Collection of documents: the files are copied and combined into a single folder. Links to documents: the files are kept at their original location. Enable everyone to visualize its role, responsibilities and position within the added-value chain. Instant publication of an intranet describing the company’s organization system. Give a collaborator an intuitive and simple access to the operational documents he/she needs to do his/her job. Ensure the availability of the latest versions of documents and procedures on a dedicated website. Enable the collaborator to question in a constructive way the operating methods of the company. Customize the way of working of the company while identifying, for each collaborator, the perimeter of responsibility. Enable to know who does what according to which internal control rules from the first day. Take the risk that some collaborators do not know what they or their colleagues have to do. To do without quick and efficient tools of description of the organization. Control that everyone uses the last version. Necessity to research the old versions of a document every time a new version is published. Lose a precious time while searching information. Lose the benefits of a browser. Leave everyone free to act according to their intuition to the detriment of procedures in place. Take the risk not to respect the good rules from the first day of the collaborator in the company. Ensure that management systems respect the rules, laws and management standards. Recording and follow-up of audit reports. Click-N-Check® is a module for managing audits of companies. It provides the manager with a quality set of tools for planning, implementing and monitoring audits. Ensure that the management systems respect the rules, laws and management standards. Program or plan the audits in 3 clicks. Support the audits targets with the level of risk, the level of priority of the suggestions or the indicators. Identify and inform instantly the audits stakeholders. Follow the evolution of the management system conformity rate with the standards that the company chose to respect. Visualize in one click the rate of conformity with the requirements defined by standards and laws of the systems in place. Manage several audit reference systems through an integrated interface. Build improvement plans based on factual observations of the weaknesses or risks listed during audits. Facilitate the preparation of the direction review. Risk that the management system does not cover some requirements applicable to the company (legal or voluntary). Lose a lot of time to identify objectives, criteria and pieces of evidence of the audits to realize. Risk of not programming the audits in the sectors where the risks are at the highest level. Not having a reference system corresponding to the company’s way of functioning. Not being aware rapidly of the improvement priorities. Tedious passage from an audit reference system to another. Improvement plans not synchronized with management systems. Manual preparation of the audit reports for the direction review. Sort, organize into a hierarchy the improvement potential. Build action plans and measure the continuous improvement. Recording and follow-up of non-conformities, corrective actions and improvement. Sort, implement a hierarchy for the improvement possibilities. Build action plans and measure continuous improvement. Simply, rapidly and efficiently manage quality committees and direction reviews. 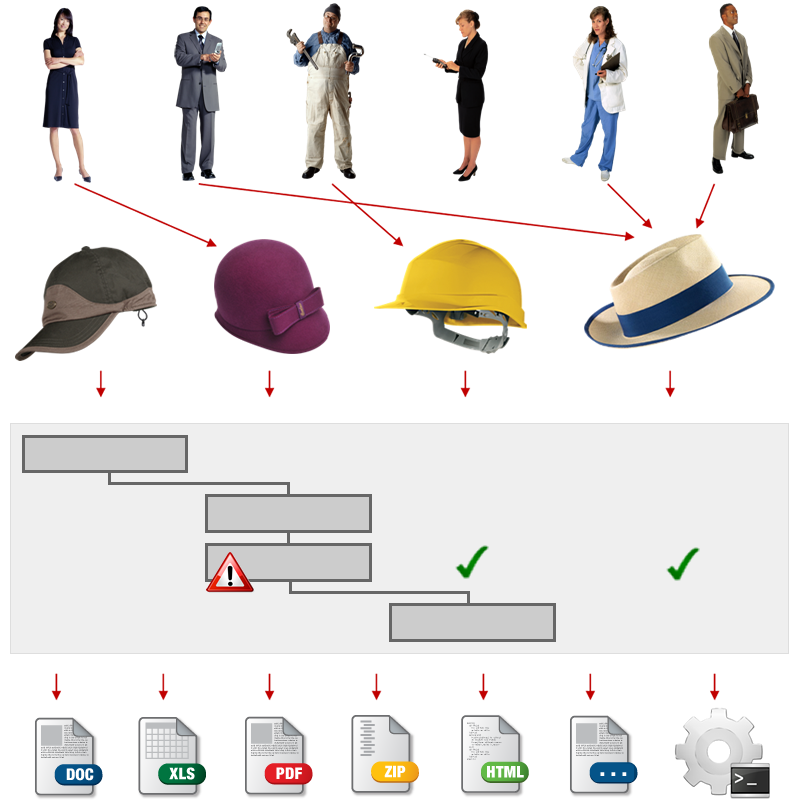 Access in a selective way to the different elements of the organization system. To have a panoramic view of the level of working of the company. Sort and implement a hierarchy for the improvement possibilities. Build improvement plans and automatically update the tasks/roles. Have a cost-benefits scale of the system. Evaluate the payback of the actions decided during quality committees or direction review. Not being able to sort the strategic improvements from the ordinary improvements. Lose time in the inventory of improvement possibilities. Not being able to sort the improvements according to a filter (quality vs environment vs health-safety vs priority level vs function vs company’s sector). Risk to be lost in the details. Risk not to identify the right priorities. Not being able to implement a hierarchy for the improvement possibilities. Build action plans not synchronized with the management system. Not to have the adequate tool to be aware of the weaknesses cost vs the preventive and corrective actions profit. Quality Management, CEO, Risks Manager. Real-time updatin of the risks (identification, quantification). monitor and control risks that may positively or negatively affect the company’s activities. Quantify all risks in relation to a specific set of criteria (probability, severity, level control, detectability). Define a plan for risk control. From scratch and build the specific risk model. Select a risk model to business model. This module can be used independently of other modules of Click-N-Manage® but it is recommended to facilitate the management, the combined use with other modules. Map the risks, of all nature, to which the company is exposed. List, analyze, evaluate and decide the options for the processing of the identified risks. Bring closer and control each of the identified risks through the procedures of the management systems. Decide the options for the transfer or the operational control of the identified risks. Sort the risks categories according to the company’s specificities. Link these risks to the indicators, qualifications, tasks or equipments listed within the organization system. Build action plans of the risks exposure according to the means that the company has. Update in 3 clicks the risks matrix. Tedious and hard to manage mapping. Unsynchronized system’s management and the risk management. Imagine action plans that are not re-using the elements of the existing management system (risk of tasks splitting). Not being able to evaluate the best options because of a lack of overview. To have a tool not in conformity with the company’s standards. Management of risks unrelated to the management system. Not evaluate the feasibility of risks control projects. Long and tedious update of the risks management system. Control the skills of collaborators whose activity is susceptible to impact the quality of products or services. Real-time reminder of the trainings necessary for the collaborators. Click-N-Train® is an add-on Click-N-Doc® for employee training. Skills related to the roles and collaborators. Click-N-Train® can check whether the employee performing a task without training. It was designed to streamline the planning of training. Control at all time the competence of collaborators whose activity is susceptible to have an impact on products and services quality. Evaluate the good knowledge acquisition at the end of a theory training and after an observation period on the working place. Update the qualifications that need a regular updating. Control the records (e.g. : certificates of competence) linked to the training of each of the collaborators. Manage the personal and professional skills on an integrated platform. Link the level of qualification required with the roles and responsibilities that form the management system. Be sure of the level of competence required in order to use an equipment. Provide the company with a tool helping in the collaborators assessment. Motivate the staff while visualizing clearly the levels of competence and the associated career plans. Manual and non-systematic follow-up of the collaborators profiles. Not to have a sufficient overview of the training process within the company. Not knowing when it is necessary to plan a training for the collaborators. Not remembering where are stored the certificates of competence. Manual updating of the trainings -> risks of mistakes and loss of time. Unlink trainings management/ qualifications/competences from the management system. Try to avoid that non-qualified persons intervene on working places that require precise qualifications. Tedious management of progress interviews. Lack of transparency concerning careers progression. Ensure the equipments availability at all times. Real-time reminder of the equipments maintenance. Click-N-Maintain® is an add-on Click-N-Doc® for equipment management. Paired with the roles and collaborators. Click-N-Maintain® can check whether the equipment used is safe. It was designed to ensure the maintenance of equipment. Have an overview of the state of the production equipments. Plan the maintenance at the proper moment. Ensure the incidents follow-up, breakdowns, maintenance operations. Reduce the risk of unexpected events. Optimize the functioning of the equipments. Know instantly the emergency procedures to shutdown the equipment. Request the capable persons to intervene in emergency on the most sensitive equipments. Publish automatic reports or statistics for the use of the machines. Know the equipments through files → slow and inefficient. Reactive approach vs proactive approach of the equipment management. Do not have a breakdown listing → ignorance of the machines life cycle. Not knowing how to optimize the yielding of the equipments. Not knowing what to do/ where to find the information in case of an emergency stop. Not knowing which person to inform in case of trouble.